My kid was pretty upset about this. As far as I can tell the required network is only there to show you crappy ads for other toca boca products. Boo on them. No more for me. Dear Toca Boca, This is such a great game thank you!!! Also thanks for listening to us kids and making Toca Life World it’s the best! I have no complaints but I have a game idea! It would be great if you could make a game that was like you could make your own characters! You get to choose if they are a boy or a girl, then you could choose their skin tone, hair style, hair color, clothes, and you could design their own pet! 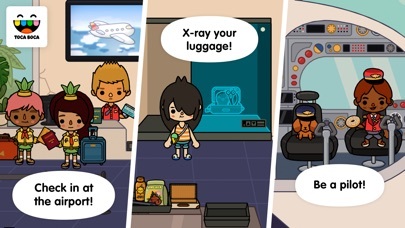 You would then be able to use the characters you create in Toca Life World!!!!! This would be so awesome please make it free if you can! Thanks Toca Boca! Updated Feedback for developers: I am in love with Toca Life World. But ever since I downloaded it, it won’t let me back in to any of the other toca apps except Neighborhood. This is a weird glitch and please fix. The other feedback I have for World is that one day I was playing the game and then all of a sudden it crashed and took me to the home screen of my device. When I went back into the app all of my progress was gone (I had totally customized EVERYTHING and this was devastating). Please fix! My final word on Toca Life World is PLEASE put all of the hairstyles in the barber shop in City. It would save me so much time. Other than that, you guys are doing GREAT! Keep it up! Side note: My friend sent you guys a letter about her idea for a toca mansion. I think that would be so cool!! please do that!!! 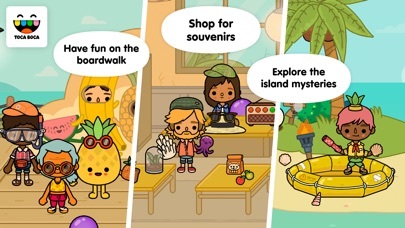 This app is in the top 5 best toca games for me , it’s great , it’s nice , it has a little plant thing but my favorite part is that Nari ( my fav toca life character) is in it 🙂 , I also really love the statue opening up and the treasure !!! I love this game a lot.It’s pretty pointless but it’s fun.When you are bored it’s something fun to do.Yet I am sad that you can’t do some things.When I am sitting on my couch and playing it won’t let me do a lot of things I want to do.First it won’t let you drown kids or put them in ovens and to me that’s the fun part of any game.Yes,I do get that the game is for young children and it’s a cute little game but there is some people like me who only spend 4$ on a pointless game to kill kids.I do love the little treasure maps and little riddles throughout the game but if you want some extra fun and funny things in a game I would not recommend this.To me it is mostly only fun when you are on long boring car rides and need a weird game to pass the time.I do love how many little details there are but I am concerned that you can throw animals of the porch and I wish you could throw children off the porch.Listen toca boca just please add in some little Easter eggs and some dark twist to kill children in a couple of your games.Overall this game is pretty good and cute and if you don’t want dark twists I would recommend it and if you do get another game. I wanted minus 10000 stars! Adios, porpoise. Adios, pink dolphin. Adios, shrimp. ADIOS, MERMAID AND MORE! All because no starter packs. Toca games usually work without internet, but this app is very glitchy and when I click on it it goes straight back to my home screen! I even tried deleting it and re downloading it but it didn’t work. Very disappointing. I waisted money on a app that doesn’t even work! Please make an online game! 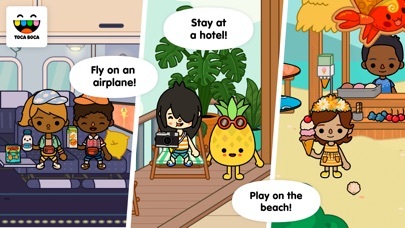 Please make an online Toca game where you can play with your friends and pick your character and dress up, go to different worlds and maybe even make a house! It would be awesome and my whole family could play it!